Ha!. Max is getting at Fang about his hair.... Wallpaper and background images in the Maximum Ride club tagged: maximum ride fang faxness. 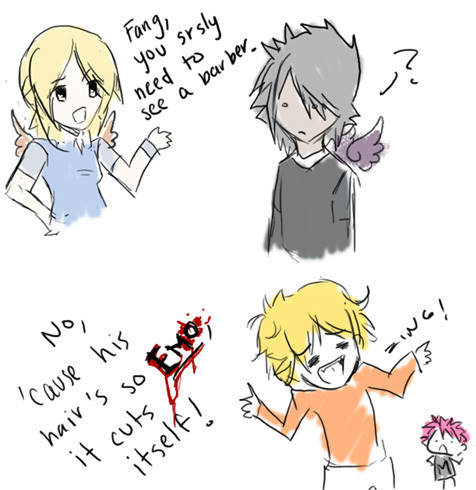 LOL only... Fang isn't emo. Seems that way though in the books. Ah, don't be so literal, gryphonforaslan. Of course Fang's not emo, but it's so much fun to razz him by telling him he is! Anyway, funny picture! I could totally see Iggy saying that. Iggy would say something like that. oh, yeah. iggy WOULD say something like that... ha ha ha ha ha ha!!!!!!! i love fangs expression, like, "what are you talking about, WHAT IS WRONG WITH MY HAIR???? :( " he he he!! just to see what his expression would be. LOL! Iggy would definatly say that! LOL! But Fang isn't emo. He's just goth. This is funny! LOOK AT THERE TINY WINGS! Who's the blonde kid? Other than, that I like it.